Considering custom universal test equipment for your automated test needs? Read this first. When does universal test equipment make sense – for a manufacturer that manufactures lots of different parts that all have the same test interface and need the same tests performed. Why a universal test station doesn’t usually make sense – when you have variable product connection interfaces, constantly evolving products, inefficient tester utilization, and tester complexity. 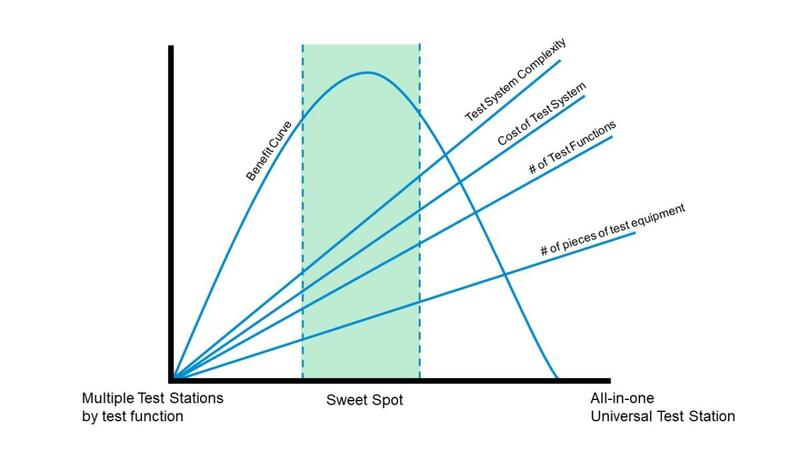 What should you do instead – we’ll show you how to find the sweet spot between universal and unique test stations, factoring in test system complexity, cost of the system, number of test functions, and pieces of equipment. Universal Test Systems are like multi-tools: jacks of all trades but masters of none. They work for those occasional, easy, common unplanned problems but struggle after that. Test stations that claim to be universal testers are very often very similar to multi-tools. They work well when your problem set is common, well scoped and unknown. Common testing needs are ones where both the test performed on the product and the interface to the product are the same. If the test and the interface are all the same then the tester can accommodate multiple products. But what happens when your products vary in their interface or the testing they need? You have to add more functionality to accommodate the variance. Driving up cost and complexity. A well-scoped test setup is one that is able to perform a variety of tests common to a grouping of products. It doesn’t mean perform all tests on all products. When you do it all you will be a master of none or just not be able to do it all. Being able to do everything initially might be possible, but require a lot of effort in development. Then when you are finally finished, your product changes or evolves, meaning you have to modify your test station design. A universal tester is a relative thing. “Universal” means different things to different companies. Company 2: has 20 products but they all do different things and have nonstandard interfaces. Company 1 may do fairly well developing a universal test station. All their products run the same types of tests so the equipment in the station will work for all products. They also have a standardized interface to the test station allowing for the control and measurement of the products to be simplified. This may equate to being able to use the same communications method for all products or time savings of not having to develop a custom interface for every product. The reality is that for most companies (those more like company 2) this is not possible due to the evolution of product design or just the variety of products manufactured. Even though company 2 makes a smaller subset of products, they’re going to have much more difficulty putting together a universal tester. The variance of what the products do means they need different types of tests necessitating different equipment in the station. Introducing switching may mitigate this, but that increases complexity, and in some cases can affect the measurements. Without standardized interfaces for the products, a new test fixture/interface needs to be designed for every product to connect it to the test station. you really need to understand your company’s entire product line and create logical groupings based on types of tests and interfaces. Base test system design around that instead of creating one test station for everything. If you do decide to build a universal test station, it can be a significant challenge both technically and financially. 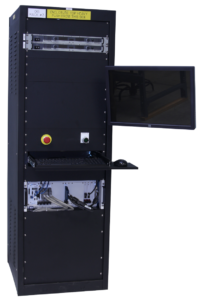 The ability to test multiple products on the same test system can be tough due to the signal routing and fixturing needed to interface with all the different physical and electrical interfaces of the products. In a universal tester, multiple pieces of test equipment are needed and only a subset may be used at a given time. This can be mitigated with parallel testing but at the cost of signal routing and software complexity. The added station complexity can make servicing or troubleshooting issues with the machine harder. This could increase your system down time and increase your personnel cost to keep the system running. Building a system that can accommodate every device can be costly due to all the equipment needed to run the variety of tests and the additional switching needed to route signals. The equipment in the station is likely to be underutilized. Accounting for future use seems like a great plan, but plans change and idle equipment is not cheap. Products change significantly, requiring additional equipment to be added to the station. One of the side effects of having a universal test station with all the hardware you will ever need is underutilized equipment. If you are not using equipment in the station for most of the test of your product, then it might not be the most effective approach for manufacturing test. Universal test stations end up in this situation when the developer tries to plan for the unknown. They think, well we might have this capability in the future so we should add this piece of equipment to test for it. Sounds like a good idea, but then that scenario never occurs or occurs infrequently. Now money has been spent on a piece of equipment that isn’t used to its full potential. Because that equipment is part of the standard hardware in the universal test station, money spent on underutilized equipment is multiplied by the number of universal test stations containing it. For example, you have a device with a LVDT, RVDT, and power output interface. A universal test station is built to test these three interfaces necessitating two pieces of equipment, an active load for the motor output and a power supply and DMM for the LVDT and RVDT. You start testing and realize that the active load and DMM are only used for half of the test. The rest of that time the equipment is sitting idle, wasting time and money. The device or station may not allow for the ability to test using both pieces of equipment at the same time, and making the station a multiple unit tester increases complexity and cost. Maybe it would have been better to make two stations at this point. One for the LVDT and RVDT testing, and one for motor output testing. This way the equipment is being used 100% on both stations while testing two different units, without adding hardware or software complexity. It may not always be possible to get 100% utilization out of all equipment during test, but striving for it should be a goal. One could argue that the time it takes to connect the unit under test justifies having a universal test station. Your device may have connections that take a long time to make or have low insertion counts. A counter argument to that is that you create test carriers for each product you have. The carrier just takes the signals from the device and routes them to a common connector back plane that could be used on multiple stations. There would just need to be a unique carrier for each unique product interface. Carriers can save test time if the connection to the station is quick and simple. A further benefit is if the products can be designed with a standardized test connection. This requires less unique test carriers, which saves time and money on the development of new carriers to connect the product to the test station. Another consideration when having lots of different equipment in a station is validation. Even though only a fraction of the test system is being utilized to test any one product, the entire system needs to be validated and verified. This can be very time-consuming depending on the number of interfaces there are, and how they need to be tested. Keeping the station streamlined to the function it is testing will help avoid these issues. Companies build universal test stations with the goal of creating a hardware and software standard. Standards are great at helping to reduce development costs. If the same equipment and software drivers can be reused, that should reduce development time and cost. This is true as long as what is being tested can actually be tested by the hardware and software in this standard. Now your company creates this great new product with functionality that is not able to be tested with your current universal test stands. What are you going to do to resolve this? Most of the time to resolve this, companies spend money to buy additional instrumentation and add it to their hardware standard. Ok great, problem solved. Except you have a new device next year that has the same requirement. So you add more equipment to your ever growing list of standard hardware. All of a sudden your hardware standards are not really standards anymore because they are constantly changing to meet the requirements of new products. You could update all your test stands with the new equipment so they are the same, but that could be cost prohibitive or not make sense if you never plan on testing those new products on all your stations. So what usually happens is that these stations become variants of your universal test stand and have some subset of test functionality specialized for certain products. This situation repeats and you end up with all these changes creating variants of your “universal” test station. If you are constantly making variants you have to ask yourself is this station truly universal? So, what can be done about this? Start with categorizing products into test type groups. For example, maybe half of the products are in need of power load testing. Create a test station that focuses on power load testing using a standardized carrier interface. Keep the test station as simple as you can but scoped for only that function. If a new product is created that necessitates updates to the power load station, it will be much less expensive to just update that station type instead of the universal test station. Doing the same update to a universal test station could just increase the complexity of the station both in hardware and software. More power switching or software updates may be needed to cram in yet another variant. Some hardware and software updates would be expected on the power load focused station, but probably significantly less than cramming it into the universal station standard. It can be harder to keep a universal test station up to date. You could spend years and thousands of dollars developing your solution only to have it be obsolete once you are complete. Smaller scoped stations are easier to keep current. Having a singular universal test station can be very expensive when the system goes down for unplanned issues. Yes, when it goes down. Obviously, it’s good practice to do planned maintenance on a system to minimize unanticipated shutdowns of your test systems, but sometimes unforeseen things happen. If and when the system does shutdown due to an issue, it will take more time getting it back up and running due to the complexity of the system, and there may not be another method of testing the product. If you have multiple focused test stations you can just use one of the other stations at decreased output capacity instead of not being able to produce units at all. Unless all your products have many of the same interfaces and test needs, you may be better off going with an approach that uses multiple stations that have the ability to test common types of device capabilities or interfaces. For example, you may have multiple devices with a few common interfaces. The table below shows multiple products with common test types and the equipment needed. The benefit curve represents the best balance between getting added test functionality at the cost of complexity, cost, and pieces of equipment. Notice the sweet spot is justified a little towards the left side of the benefit curve. This is because once you start heading down the benefit curve you increase the previously mentioned items. Only one of which, number of test functions, is really a positive. Because of this you would want to stay on the left side of the benefit curve. Now that you have a strategy, how do you get started? Get to know your products. What products do you have to test and what tests do they need? Create a matrix that shows all the products and the test functions they require. You may start to see very obvious groupings of test types. Use the groupings as the basis of the functionality of the test stations. Iterate until you feel you have hit the sweet spot of the curve and achieved a balance between testing pros and cons. This isn’t a perfect science, but it’s a good starting point. Do you want help with your test strategy? Reach out here to chat with us, or here if you’d like a custom solution assessment report.